Patrick Chung had already been playing through a lingering shoulder injury for most of the season, and as if that wasn’t enough, the New England Patriots’ safety now has a broken arm. 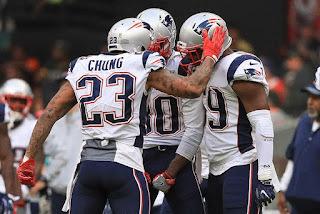 After getting caught between Los Angeles Rams’ Todd Gurley and teammate Jonathan Jones early in the third quarter of the Super Bowl, Chung suffered a right forearm fracture and was immediately put in an air cast on the field. After a few X-rays in the locker room, Chung returned to the sidelines to cheer on his team and celebrate the victory with his teammates. But now that the post-championship partying has subsided, it is being reported that Chung will now endure two surgeries this offseason, one for his arm that is scheduled for today (Thursday) and one for his shoulder injury that will occur in about three weeks, according to Jeff Howe of The Athletic. Patrick Chung is scheduled for surgery tomorrow on his broken forearm, per source. Then in about three weeks, he’ll have shoulder surgery to clean up an issue he played through for most of the season. Due to the shoulder recovery, he’ll likely miss all of OTAs and return in camp. Chung is currently signed through 2020 after signing a two-year, $11.5 million contract extension last May.